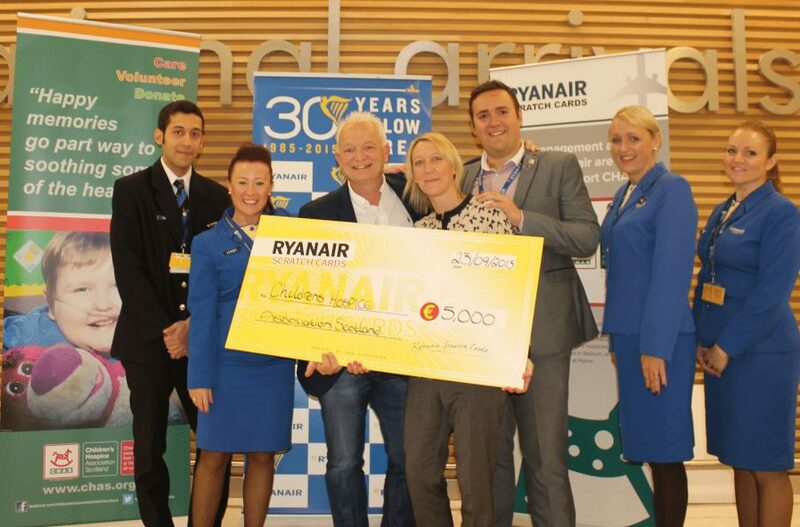 Ryanair, Europe’s favourite airline, today (23 Sept) made a €5,000 donation to the Children’s Hospice Association Scotland (CHAS) in Glasgow, the latest in a series of charities to receive on-going support from Ryanair’s “Fly to Win” scratchcards. Ryanair’s Chief People Officer, Eddie Wilson, presented the €5,000 donation to Debbie Mooney, Head of Fundraising and Development of CHAS, the only charity in Scotland that provides vital hospice services for children and young people with life-shortening conditions. Ryanair’s scratchcards are very popular with passengers who can win prizes of cash, luxury cars, or scoop a cool €1 million – all for a stake of just €2, which funds numerous charity donations across Europe.